Bob Ross was awesome.. and you are right, his voice was hypnotic - it could have been the ultimate cure for insomnia. But the dude had legit talent. Big smile! I think we must be related. My dad and I watched the same show and I found myself taking a nap. However, the man could paint. LOL. Memories. Give your grandmother a hug for me. Alzheimer's is a very sad disease and hard for us to see those we love go through it. Oh I can hear Bob Ross's voice now softly caressing my earholes. 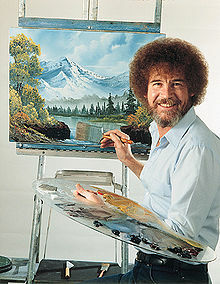 I loved the way his paint brush sounded when he painted "happy trees." I loved that show. Thanks for this post, it made me smile. I used to love his show. It made me want to get high, eat something, and then calmly paint something. Wow! Even after all this time, I still love the way you can send my memory banks into hyperdrive! I used to try and paint along with him. With his techniques, I could make it look okay, but as soon as i tried to do something of my own, it always sucked and sucked hard. Yes! Great post. My parents used to be so annoyed by Bob Ross...but I loved him. They'd do the super eye roll every time I'd turn his show on too. My parents were so mature. My family would watch the show on Saturday mornings on PBS. You're right, he did have the sleepy effect on people! Agree with him putting me to sleep. Sidenote: Your bangs in that picture are ROCKING! I loved Bob Ross with his happy little trees and soothing, hypnotic voice. you have no idea how HAPPY you made me with this post today. I used to LOVE Bob Ross and I still miss him. I used to watch him on Sunday mornings. As you said his voice used to sooo soothe me (I used to think it was just ME lol). Thank you for bringing him to life again! This post was my favorite of the day! I watched him in the 80s when I was little. I totally wanted to be an artist in third grade. Then I saw my own work and decided to be a writer instead! I loved watching Bob. I have always thought that I would be able to paint, and watching/listening to him made me believe I could do it even more. I have still to try it, but his technique and methods are so simple and look easy to do. Someday I'll try it! I'll paint my "happy little trees" and decide what will "live over here", etc. Dammit it miss Bob! I used to actually get turned on by him as sick as it sounds! That voice...and that killer fro! Yummy! I totally remember this dude. I didn't know he had died. How sad. I couldn't agree with you more, it was his voice - so relaxing. I could watch him paint for hours. Oh Bob Ross! We was the greatest! I remember watching him with my little sister in the afternoons. We loved it when he would drop a big dark line right down the middle of his almost completed painting. Every time we would be shocked when he turned that line into the trunk of a tree and then filled it out with leaves. It always looked great afterward! He was and is one of my inspirational art heroes! I still watch his show from time to time. He always made it look so easy. My husband and I both loved Bob Ross if for nothing else than watching him and falling asleep on Saturday afternoons. A few years ago I found a happy trees shirt at Target and it's still one of his favorites. I remember watching him a time or two...but usually something else caught my attention like Gilligan's Island. Did you know Bob Ross was in vietnam? Crazy right? Love his art. Your blog rocks my world so I gave you an award! I miss the happy trees! I used to watch this with my sisters on Sunday mornings when I was little. I was always fascinated at what he could d.
I loved this dude. I can't believe how captivating his show was. Oh, that is sad that he died from lymphoma. :( You forgot one thing about him back from the 80's. Bob Ross was HOT. Bob was always so happy. I often wondered if in real life he was dropping F bombs and the like. i totally remember watching this with my Nana!